The Native Americans loved the pawpaw. It was readily available to them and it had many uses. However, despite the fact that they’re very useful and there are still many of these trees throughout the states where they’re a native species, they’ve been largely forgotten by society at large. If you’re a prepper in one of those states, and pawpaws don’t figure in your emergency planning, this article is for you. The pawpaw tree, known in the scientific community as Asimina triloba, is a fruit-bearing tree that is more prized these days for its attractive foliage and blooms. The tree itself is small compared to many other native species, topping out at about 35 feet tall with a trunk between 8 and 10 inches across. The leaves are large, simple and elliptically shaped, usually dark green in color and shiny. In fall the foliage turns a brilliant rusty yellow color. The tree’s flowers, which bloom in early spring, are maroon in color and six petaled. It’s worth noting that the flowers stink – the smell is often described as like rotting meat. Pawpaw fruits start out light greenish-yellow, and turn to brown as they ripen in late summer and early fall. They’re oblong, roughly bean-shaped, and vary in size from a couple of ounces to about a pound. 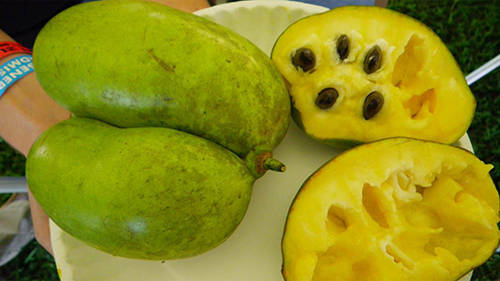 Many people say that pawpaw fruit tastes like a combination of mango and banana, and the texture is similar to that of a banana as well; it feels a bit like a thick custard. Technically speaking the pawpaw is a berry, and they grow in bunches similar to bananas, another misclassified berry. It’s likely that, despite extensive historical use and availability, the pawpaw isn’t a common food today because it spoils quickly compared to other fresh foods you find in the supermarket. You may be able to find freshly harvested pawpaw at a local farmer’s market, though, or you can go foraging for it if you live somewhere it grows in the wild. Why did Native Americans Love the Pawpaw? Simply, because it was quite useful. The Iroquois ate the mashed fruit plain, or dried it either whole or mashed and made into small cakes, and it was a big part of the diets of many other Native American tribes as well. The Cherokee loved the pawpaw for its fibers. They used the bark of the pawpaw to make rope and cordage for bow strings, fishing, and construction. The seeds were also ground into a powder by some tribes and used as a louse deterrent. The pawpaw seems like a tropical plant. Its large, deep green leaves and the nature of the fruit it produces seem to fall in line with what we think of as tropical fruit-bearing trees. Despite that, though, pawpaw actually does great in more temperate climates like those found in the US. It is often found in floodplains, and grows densely to form patches a few years after a forest begins to develop. 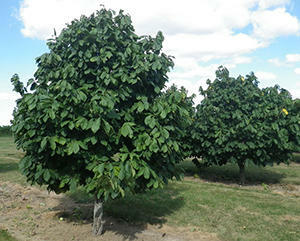 Because they grow quickly they often dominate over slower-growing trees and take over an area, forming a pawpaw colony. Where Can You Find Pawpaw? In the US, pawpaw can be found in what is affectionately known as the ‘pawpaw belt’. It encompasses 26 states and parts of Canada. They’re found in the East, South, and Midwest. You can find pawpaw from New York to Florida, over to Texas and up to southern Canada. Which Parts of the Pawpaw are Edible? The fruit itself is edible, but you probably don’t want to eat the skin. Instead, cut the fruit in half or peel it to get at the custardy insides. Just scoop it out and eat it plain or add it to any number of recipes. The seeds likely won’t hurt you, but you probably don’t want to eat them out of hand. The tree itself isn’t much good for eating except when it comes to some medicinal uses. The pawpaw fruit is quite beneficial, nutritionally speaking. It is high in protein for a fruit, with 1.2 grams per 3.5 ounce serving, plus it’s a good source of fiber. It is also high in vitamin C, potassium, manganese, magnesium, and iron. Pawpaw can be used in place of banana in many recipes due to its similar taste and texture. It’s great in baked goods when substituted for bananas, and pawpaw ice cream is very popular when it’s available. This fruit can even be made into a liquor that some people say is exceptional. People aren’t the only ones who enjoy pawpaw. It’s a common staple in the diet of many North American mammals, including bears, foxes and raccoons. Pawpaw isn’t a one-trick pony. This tree has several uses, and the fruit isn’t the only useful part. The seeds, bark, roots, and leaves are all used for other things. Pawpaw extract has been known to eradicate head and body lice and other parasites. As an anti-inflammatory substance, pawpaw is used in homeopathy to treat several conditions from certain types of cancer to mild pain, especially in the mouth and throat. It is also used to treat fevers and can be used to stop vomiting. There is some preliminary research out there that shows that pawpaw may be useful in salve form as a treatment for the herpes simplex virus, as well. Pawpaw contains a compound that naturally repels insects, and is therefore often used in insecticides. Despite its insecticidal tendencies, there is one bug in particular that relies solely on the pawpaw for its food and nesting ground. The zebra swallowtail butterfly in its larval form eats only the pawpaw, so that the chemicals found in the leaves can protect them from predators. The fibrous bark can also be used to create cordage that could come in handy in a survival situation or for craft applications. It has been used historically for bow strings, fishing line, fishing stringers, and other trapping purposes. Rope made from the bark of the pawpaw could also be used for construction of shelters. If you live in the ‘right’ half of the US, be sure you don’t overlook the pawpaw tree while foraging or training in survival tactics. Was the way we sang in Tennessee. How old does this tree have to be to produce fruit? I believe paw paw is related to persimmon and it took ten years for our persimmon trees to start bearing fruit. There is a folk saying in Japan that says it takes seven years for a persimmon to bear fruit. Climate in Japan is considerably different from SoCal which may account for the difference. It depends on the climate, but it’s usually going to be around five to seven years. 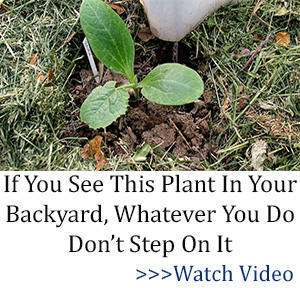 If you’re looking to plant your own trees that’s definitely a long-term project. You can get a rough idea of how long it’s going to be once you have a tree; check how fast it’s growing, because it’s going to start producing fruit when it’s about six feet high. So glad I found this group. Very educational! Where can I buy some? I live in Florida and I am not having much luck.